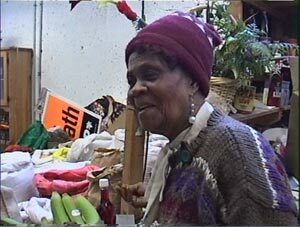 Dr Tilly Johnson, 82, one of Hamilton Farmers’ Market’s longest-serving vendors, has been slapped with a 30 day suspension under the Hamilton Farmers’ Markets’ Zero-Tolerance policy. The staff acted on a customer’s allegation that she was harassed by Johnson; the incident occurred Saturday, May 21st. Miss Tilly at her old location, chatting with a customer (out of photo). Johnson was given notice at 3 pm Friday. Despite Ms Tilly’s requests that market staff review the security videotapes of her stall, she has been denied this opportunity. She has been ordered to close her stand for 30 market days—till the end of July 2011- in a memo issued by market manager Bill Atanas and director of culture Anna Bradford. She has funded a scholarship in her name for Caribbean students to pursue post-secondary education since 1997. Tilly also successfully championed Human Rights legislation for racial justice; this fighting spirit is maintained even now. She plans to ignore the suspension order, and set up at the market as usual. Farmers’ Market manager Bill Atanas has said that she will be removed by security for trespassing if she disobeys the order. The zero tolerance policy enacted against Johnson does not account for differences in cultural communication, nor does it provide any way to dispute decisions made by the City. Johnson recently suffered the loss of her longtime spot on the market ramp, and was relocated to an inferior spot in the rear of the market along a bare, unfinished wall. A senior and independent businesswoman, Johnson will be required to continue rent payments, while having no form of livelihood from May 28-July 20th, 2011. This injustice against a pillar of Hamilton’s community must be protested.